The trail sits atop the levee along the Licking River. 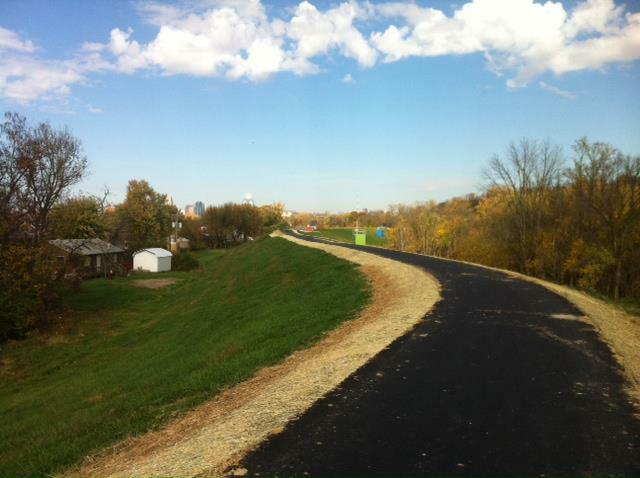 Construction is nearly ready to begin on the final two phases of the Licking River Greenway Trail. Covington Parks and Recreation Manager Rosie Santos says the paved walking and biking path will be more than a mile-and-a-half long when finished. The existing trail is about a quarter of a mile, and offers access to nature trails on the other side of the Licking River levee. "This is a very accessible outdoor activity," Santos says. "You don't need a lot of equipment, you can just get out and do it, and it connects neighbors and communities." The idea for a mixed-use path sprang up in 2008 as part of Northern Kentucky's long-term strategic plan, then known as Vision 2015. Phase 1 opened in 2012. Covington is trying to position itself as a hub for outdoor recreation. Ultimately, the city would like to see the trail connect into the Riverfront Commons trail and extend all the way to Devou Park. Santos says it's taken a long time to gather the funds and permissions needed for the trail along the Licking River levee. Phases 2 and 3 are expected to cost more than $500,000 for construction and design work, she says. 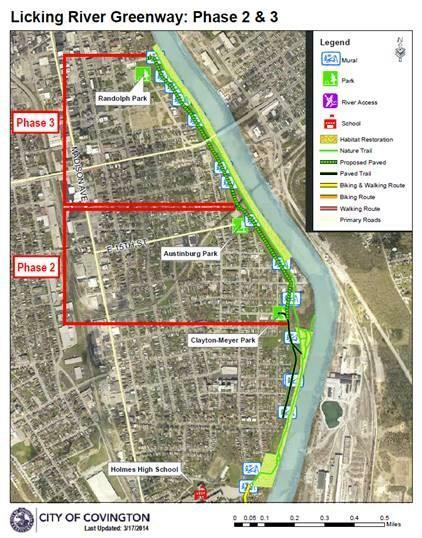 The first phase of a six-city walking and bike trail in Kentucky along the Ohio River is now open. Southbank Partners President Jack Moreland says eventually the 11.5 mile trail called Riverfront Commons will extend from Ft. Thomas to Ludlow. "People are beginning to want to come back to the urban core to live," says Moreland. "Apartments are being built... primarily for young professionals... They want to walk. They want to bike. They want to be close to amenities so they don't have to get in their cars and drive 30 miles to the mall." A new Northern Kentucky walking and biking trail is expected to ramp up economic development. Governor Steve Beshear stood on the largely deserted Covington Landing when handing over a $4 million federal check Wednesday that will help pay for Riverfront Commons, an 11 mile walking and biking trail from Ludlow to Dayton and beyond.